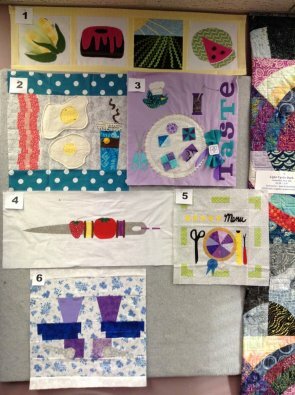 Row by Row Winner @ Cut Up & Quilt! Congratulations Elaine Snedden, the winner of our 2019 Row by Row Challenge! In February we announced a contest for our 2019 Row by Row design. We had six wonderful entries. Our CUAQ Therapy groups voted this past Thursday and chose entry #4 by Elaine Snedden as we make the final model and pattern. Elaine won a $100 gift card for her design, "Stitch Kebab". All designs were clever and wonderful and we're sorry we can't use all of them! Sarah Baker, Dorothy Felker, Sally Dea, Denniele Bohannon and Rich Snedden each won a $25 gift card for submitting a design. We certainly appreciate their efforts and love that CUAQers had a say in our row.